The article by Wolfgang Felix “The Dailamites during the pre-Islamic Era” was originally posted in the Encyclopedia Iranica on December 15, 1995 and updated on November 22, 2011. Kindly note that the pictures/illustrations inserted below do not appear in the original Encyclopedia Iranica article. In antiquity the Deylamites [or Dailamites] (Gk. Dolomîtai and variants) were mountain tribes, usually identified by 10th-century Arab geographers with the inhabitants of Deylam, the highlands of Gīlān. A considerably broader distribution extending as far as southern Armenia and the Caucasus can be deduced, however (Minorsky, p. 193). A view of Gilan’s forests in northern Iran, home of the ancient Dailamites (Source: Public Domain). In the Pahlavi Kār-nāmag (tr., p. 47) it is recorded that in the final years of the crumbling Parthian empire Artabanus V (or IV) mobilized all the troops from Ray, Damāvand, Deylamān, and Patešḵᵛārgar, evidence that the region south of the Alborz was inhabited by Deylamites. More precisely in the Nāma-ye Tansar (tr., p. 30) it is stated that Deylamān, Gīlān, and Rūyān (later part of Ṭabarestān) all belonged to the kingdom of Gošnasp of Ṭabarestān and Parešvār, the latter apparently the Alborz region. Gošnasp made his submission to Ardašīr I (224-70) only after thorough consideration and kept his realm by the guarantee of Ardašīr himself. The dynasty was still ruling there in the time of Pērōz I (459-84; cf. Masʿūdī, Tanbīh, p. 99-100). Kavād I (488-531) appointed his eldest son, Qābūs (Kāōs), king of Ṭabarestān (Nāma-ye Tansar, tr., p. 70; Ebn Esfandīār, tr. Browne, pp. 92-94). Toward the end of his reign (while the Roman emperor Justin I [d. 527] was still alive), Kavād dispatched Būya (Gk. Bóēs), “bearing the title wahriz” (Gk. ouarízēs), against King Gurgēn of Iberia (Procopius, De Bello Persico 1.12.10). That Būya had come from Deylam can be deduced from a tradition according to which the wahriz (i.e., Ḵorrazāḏ b. Narsē b. Jāmāsp) who conquered Yemen during the reign of Ḵosrow I (531-79), in about 570, had formerly been governor of Deylam (Masʿūdī, Tanbīh, p. 260; Ḥamza, p. 138). The troops of the wahriz also included Deylamites (Nöldeke, Geschichte der Perser, p. 167). 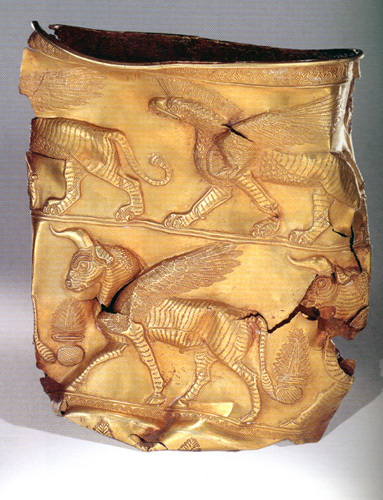 Golden cup depicting winged beasts (winged bulls at bottom and winged griffins at top) dated to the 1st half of the 1st millennium BCE (Source: Public Domain). This was discovered at Marlik, Gilan province, northern Iran. Procopius (De Bello Gothico 4.14.5-7, 4.14.9) reported, from a western point of view, on the Dolomîtai at the siege of Archeopolis in the disputed territory of Lazica during the reign of Ḵosrow I (about 552): They were independent allies of the Persians, living in inaccessible mountains in the heart of Persia (i.e., Media) and fighting as infantrymen, each armed with sword, shield, and three javelins and accustomed to warfare on mountainous terrain. Some time later, according to Agathias (3.17.6-9, 3.17.18-22), the Dilimnîtai, “the largest tribe of those dwelling on this side of the river Tigris in the region of Persis” (i.e., in central Persia, or Media), undertook a fruitless attack against the Hunnic Sabirs, who were in the service of the Romans, and vainly charged the fortress of Phasis in Colchis. Recreation of Sassanian infantry units during the 2,500 year celebrations of 1971- note the Drafsh Kaviani displayed at the front. Roman descriptions of Sassanian infantry were negative at first, but this changed with the arrival of Dailamite infantry from northern Iran. Picture source: Kaveh Farrokh, p.230, سایه‌های صحرا-Shadows in the Desert: Ancient Persia at War-Персы: Армия великих царей,2007. Agathias characterized the Deylamites as very warlike and independent allies of the Persians, skillful warriors in close combat or at a distance, using sword, pike, and sling. In a fragment from Theophanes (preserved in Photius, Bibliotheca 64) it is related that in the battles between Persians and Romans during the reign of Justin II (565-78), which broke out in 572, the Deylamites (Gk. tò Dilmainòn éthnos) joined forces with the Persians and the Sabirs. When power passed from Ohrmazd IV (579-90), to whom the Deylamites had submitted, to Ḵosrow II in 590 a certain Zoarab, leader of the Deylamites, rose up against the latter and joined the party of Bahrām VI Čōbīn (590-91; Theophylact Simocatta, 4.4.17, 4.3.1). When Bahrām Čōbīn’s rising failed the Deylamites joined the rebellion of Besṭām (see BESṬAMÚ O BENDOY), a maternal uncle of Ḵosrow II (probably 592-95; cf. Nöldeke, Geschichte der Perser, p. 486). After the fall of Besṭām the šahr-wahriz (i.e., governor of Deylam) fought against the remnants of his army, consisting of Deylamites and Armenians, in alliance with Smbat Bagratuni, marzbān (margrave) of Gorgān (Sebeos, tr., pp. 43-46). Incidentally it was reported (Balāḏorī, Fotūhá, p. 282) that Ḵosrow II had a personal guard of 4,000 Deylamites. When the Arabs conquered Persia the Deylamites remained virtually unsubdued, ruled by their own dynasty until the 9th century (cf. Minorsky, p. 190; Markwart, Ērānšahr, p. 127; see ii, below). The Rodkhan Castle in Gilan (Source: CNN). The construction of this castle is generally attributed to the 11-12th centuries by the followers of the Ismaili sect, however the origins of this structure may be traced back to the pre-Islamic era. Christianity entered Deylam fairly early; in 554 there was a diocese of Āmol and Gīlān (Chabot, pp. 109, 366). The religion obviously survived for a long time in these inaccessible regions: The Nestorian patriarch Timothy I (780-823) elevated both Gīlān and Deylam to the status of metropolis (Thomas of Marga, I, pp. 252-53; II, pp. 467-68), though evidence from a letter of the patriarch suggests this separate status was limited to the years 795-98 (cf. Braun). These arrangements were, in fact, not stable; in about 893 Elias, metropolitan of Damascus, mentioned only Media (=Ray) as a metropolis, and the lists compiled by Ebn aḷ-Ṭayyeb (d. 1043) and ʿAbdīšōʿ, metropolitan of Nisibis (d. 1318), are silent about them (Sachau, pp. 21 ff.). The metropolis of Deylam does, however, reappear in the lists given by the early 14th-century historians of the Nestorian patriarchs, ʿAmr b. Maṭṭā and slightly earlier Salibhā b. Yūḥannā (Maris Amri et Slibae, pp. 126, 132). It seems that remnants of Christianity must have survived up to that time.